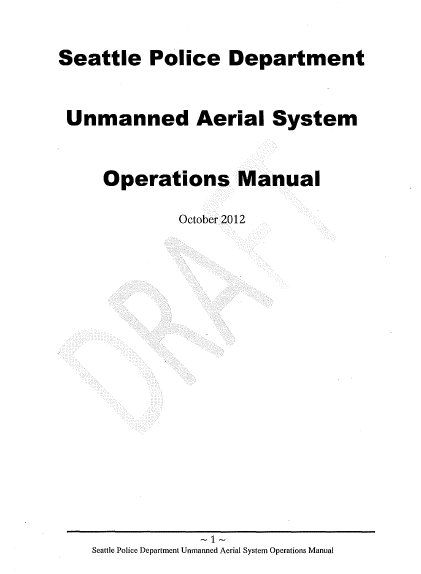 The following is the draft unmanned aerial system manual released last month by the Seattle Police Department. Thanks to Carlton Purvis for pointing it out to us. The following procedures are intended to promote safe, efficient and lawful operation of the Seattle Police Department’s unmanned aerial system (UAS). Safety, above all else, is the primary concern in each and every operation, regardless of the nature of the mission. It shall be the mission of those personnel of the Seattle Police Department who are trained in the use of unmanned aerial systems (UAS), to use this resource to protect the lives and property of citizens and first responders in a constitutionally and legally sound manner. Use of an aerial system can be utilized in circumstances which would save life and property, as well as being able to detect possible dangers that could not otherwise be seen. The use of UAS’s is quickly growing but had it been available during large catastrophes such as hurricane Katrina, it would have had a large impact on all aspects of emergency response when personnel were in short supply. UAS’s can support any responder in any all-hazards incident that would benefit from an aerial perspective, Additionally, the UAS would have suitable uses in locating and apprehending subjects, missing persons, search and rescue operations as well as any task that can best be accomplished from the air in an efficient and effective manner. It shall be the intent of every UAS operator to make reasonable effort to not invade a person’s reasonable expectation of privacy when operating the UAS. When operating the UAS, the Seattle Police Department will abide by all FAA Regulations for flight and receive the proper authorization for flight. Additionally, the need, availability and use of the UAS will not supersede the issuance of a warrant when needed. a) When the UAS is being flown the onboard cameras will be turned so as to be facing away from occupied structures, etc to minimize inadvertent video or still images of uninvolved persons. b) All video and still images will be maintained in strict compliance with SPD policies and procedures. d) The SPD UAS unit will not conduct random surveillance activities. The use of the UAS will be tightly controlled and regulated. All other requested uses will be approved by the Special Operations Bureau Chief prior to accepting the mission. g) The SPD UAS program will operate,strictly within the law and regulations. If in doubt, prior to operating the UAS we will ensure that warrants are applied for and obtained. We will balance all operations with. the need to accomplish the mission while maintaining public privacy and the freedom from intrusion.